Hello. This is Jean Caragher, President of Capstone Marketing. I am very happy to be talking today with Lexi McWiggins, Senior Marketing Coordinator, Event Manager, and Graphic Designer at P&N, and the 2014 AAM Rookie of the Year. 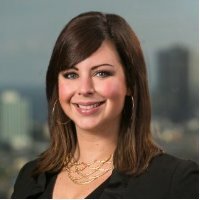 Lexi joined Postlethwaite & Netterville, or P&N, in 2012. She assists the Marketing Department and her firm with graphic design projects, educational events and seminars, as well as trade show management, advertising, resume management, and professional presentations. Lexi, congratulations on being named AAM’s Rookie of the Year. Lexi McWiggins: Thank you so much. It was a great honor. Of course, I wouldn’t have been able to do it without my great team at P&N, but it’s always fun to be recognized for your hard work. Jean Caragher: It absolutely is very well deserved, because AAM names the Rookie of the Year for “going the extra mile”. Let’s start off with my asking you, with your experience in working in a CPA firm, what do you find is the greatest challenge in marketing a CPA firm? Lexi McWiggins: As you mentioned, I only have about two years of experience working with a CPA firm, but I do have a couple of years of experience in marketing prior to that. I came from retail marketing. One of the biggest challenges I see in marketing CPA firms has to be that a lot of companies understand that your CPA firm offers the traditional tax and audit services. However, so many firms today are starting to diversify. In order to market those other services, you have to rebrand yourself so often, even with your current client base, which is very difficult, especially for our established partners who have been selling the same things for years and years to their clients, who have been clients for years and years. All of a sudden they have to talk about technology services, or consulting services, things that are not part of their normal conversations. That’s a big challenge for us right now, at least. Then, just business development in general. There is so much competition out there. Everyone thinks they can be their own accountant. Technology is making things a lot easier for some people, and there are still a lot of companies who feel that they can do things on their own. I think that being able to get across that we can be a business advisor, so much more than someone who just turns in your tax returns for you is a challenge, but we’re happy to tackle that. Jean Caragher: That first challenge you mentioned, how is P&N dealing with training or communicating the variety of services that the firm offers? Lexi McWiggins: Our first step was to train our employees. We have a Lifelong Learning Program that we are working on, to incorporate our firm’s values into the everyday of our employee’s lives. If we really focus in on quality service, we’re giving them the tools they need to provide quality service. One of the things that we want to focus on in terms of our values is that lifelong learning piece. Right now, we’re giving a lot of training classes to our employees. We have classes ranging from the soft skills, which are presentations and writing, all the way to how to close a deal with someone who has absolutely no interest in hearing your services. That education piece is definitely the first step, we educate them with all the services that we offer. We had people come in from all the different departments to give 10-minute overviews of what they do, what kind of questions your clients may be asking that should point them in the right direction of a service they need, because although you may be a traditional tax accountant, you know someone who works down the hall from you that can offer more complicated business valuation services. That’s our first step, the education piece. Jean Caragher: Now, this may not be a fair question given your short tenure in accounting marketing, but what is your prediction for the next five years in accounting marketing? Do you get any vibes one way or the other? Lexi McWiggins: With the barriers to entry for the professional, in general, and the technology being so available, I think firms need to be creative, they need to diversify. Moving forward a lot of firms are going to focus more on their niche development, strategizing on how to specialize in certain markets so they can offer a different service than a competitor, trying to find some ground that no one else is covering. You can train your people in a certain industry to be the leaders of that industry, so the thought leaders are being engaged in that part of the process. That’s one way people are going to be heading. Then, having people switch gears with their business development conversations is going to be a big part for us, at least. It’s so easy to rely on referrals in the past. With the competition being what it is now, people are going to have to switch their gears to be focused on offering solutions, rather than just services. That’s one of the chains of thought that we’re trying to ingrain, that you’re not selling, you’re solving problems. Moving forward a lot of firms are going to start switching to that mind set. Jean Caragher: Do you find that your people are more open or perhaps less intimidated with that change in terminology, in referring to it as offering solutions as opposed to sales? Lexi McWiggins: I really do. I don’t know an accountant who goes to school to learn how to be a salesman. They are there to crunch numbers, and solve problems all day. They are so ingrained in the facts. When they hear the word sales not all of them are outspoken, and they are not all extroverted personalities, so that’s very intimidating at points. It’s important to have that shift in mentality, that you’re not having to worry that everyone talks about the cheesy car salesman who is going to sell you anything but doesn’t really believe in the results. Well, we’re selling that listening to your clients and understanding what they really need, and listening and having a conversation with prospects, you are able to understand how to solve a solution, and not just sell them the service you’re offering. Even if you’re not the person who can personally solve the solution, you know someone down the hall who can. Jean Caragher: Tell me, which of your personal skills contributes most to your success at P&N? Lexi McWiggins: Not that I get made fun of too much for this at the office, but I always try to have a positive attitude. A lot of times people come to the Marketing Department venting, and they have problems they need us to help solve. In some ways we are the face of the firm. We always need to have a positive attitude and outlook on whatever we’re tackling. Even when we’re stressed and we’re working crazy hours or we have a lot on our plates, we’re positive. We’re always cheering on our team members. The rest of the firm can easily see that. I try every day to make sure that I always have a good attitude, in spite of how busy we are. We’re always excited to say how great P&N is and really hopeful. If we’re excited about it, then they will be excited about it. That’s one of the things that I think helps me a lot. Then, also offering excellent customer service. Our customer is our firm, it’s all the employees that work with us. If we continually show them what good customer service is, hopefully they are going to do the same thing and show our clients what good customer service is. Jean Caragher: That’s an example of treating other people in a way that you want to be treated in return. Jean Caragher: It could be as simple as that, right? Now, I’m sure that you are building your network in accounting marketing, and you’re involved with AAM. What other factors or skills do you see in other marketers that make them successful? Lexi McWiggins: It’s hard to pinpoint, because you have a very diverse set of skills in this day and age with marketing. Our team currently has five people, and we have five very wide variety of skill sets. I focus more on the graphic design areas, so I’m more the creative and, I guess, energetic side of the marketing process. I have a teammate who is an amazing editor and writer, so being able to diversify your skill set is important. Some of those things may include video editing, being able to design infographics. It might be content writing whenever your partner may have time. The partners at your firm may have time to only give you an outline for a blog post. If you’re able to write well you can take that blog post and make it great. I think those skill sets are definitely important. Our market is changing so much every day with technology. I personally set aside an hour or two every Monday and I do a tutorial of some sort. There are a couple of different websites that I use, and I log in every single Monday to learn something new, because you never know when you need it. You might not ever use it, but you never know. Jean Caragher: That is an excellent time management tip, because we both know we have full weeks and the time can pass so quickly. You need to block off that appointment and stick to it. Otherwise, it doesn’t happen. Lexi McWiggins: I block things off on my calendar all the time, even if it’s just me and my computer, because sometimes you really just need to dig deep into your projects to devote the attention that they need. Blocking time on the calendar is huge, and it does a favor for me. Jean Caragher: Your winning the Rookie of the Year was due to what you’re achieving at P&N. You do a lot of events, so I’d like to talk about that a bit. Give us an idea of how many events the firm sponsors, what are the topics of those events, are they lead generators. How does that work at P&N? Lexi McWiggins: We have three main markets that we do our events in. We try to host events throughout the year for our clients and prospects in our three larger offices. It serves two purposes. One, it’s to give our clients free CPE; we don’t charge for our events. Then, it’s also to get in front of our clients and say, “Hey, how you doing? How did it go last quarter, or what can I help you with this quarter?” You know, face-to-face, building relationships. It also shows our prospects that we have very strong capabilities in certain areas. Our topics range everywhere from technology – we did a cyber-security seminar recently – to your traditional tax and accounting updates. We have a seminar coming up at the end of this month for government agencies, so we’ve invited all of our governmental clients. They’ll get eight hours of free CPE and be able to be heard by speakers throughout the state who have a lot to say that could help them in their jobs every day. Jean Caragher: Now, this is hard work. I’m a fan of seminars, because it gets you face-to-face with your clients and people that you want as clients, but it’s hard to get the people in the seats. How many people are attending these events? Lexi McWiggins: We typically have around 40 to 50 seminars a year. It doesn’t sound like a lot, but it is a lot. Jean Caragher: Oh, it is a lot! Everybody, for the purposes of the recording, 40 to 50 events a year for P&N. That’s a tremendous amount. Lexi McWiggins: It is; those are just our seminars. We do other events that are more networking based and don’t have an agenda. Those are kind of happy hour, more fun, low key. For our educational seminars, depending on the market, we range between 50 and 100 people for each of them. We have a couple of seminars that are larger. Our governmental ones we’ll have around 250 people; for the most part there are around 50 to 75. It takes a lot of email nagging, as I like to say, to get people into the seats. P&N will send out the initial email to the full list. Then, we make our partners, our managers, and our associate directors follow up individually to each of their clients that they’re inviting. It’s hard to say no to your personal contact. It’s very easy to say no to some nameless face at the company that you hire to do your tax return. It’s a good method for us. We challenge our employees to use it as a way to reach out to someone, giving them the tools to have a conversation without it being awkward and not having to be salesy. It’s, “Hey, we’re having a seminar, it’s free. Lunch is on us. Come learn about XYZ.” It works really well. We have great attendance. Almost every seminar we have waiting lists. Jean Caragher: You brought up a great point. Clients ask me a lot, “How do we follow up with people that we’ve been networking with?” or “We had this mixer last week with some attorneys, so how do we follow up with them?” Extending these invitations is a great way to follow up. Jean Caragher: This must result in tremendous client loyalty and satisfaction. Do these events also generate new business for you? Lexi McWiggins: They do. We find that a lot of times, it may take two or three years for you to see your lead pay off. They’re developing that relationship, not all the time does someone need an accountant for something, or business advisor, or an attorney. We try to stay in front of them as much as possible; that’s why we have so many events. We do see results quite a bit; sometimes it’s quicker than others. When there is new legislation that comes out, people tend to get scared, and they hurry up and hire you for something, because they want to make sure they stay compliant. We had a HIPAA seminar in one of our markets not too long ago where we invited a bunch of healthcare workers. They were jumping to talk to our professionals after the seminar. I think we got a few client engagements out of it, just from that one day. Of course, it pays off very fast to host a lunch for someone and then you have a client engagement from it, you know, because obviously the client engagement is very worthwhile. Yes, we do actually see results from it, sometimes more than others, but we definitely see results. Jean Caragher: Do you track these results and share the results of those events? Lexi McWiggins: We do. We probably should be tracking more than we are, of course. It’s difficult for people to email in their daily scheme of things; they may forget to report that they had a conversation with someone that they happened to run into somewhere. We do a very good job through our pipeline process of keeping track of how we’re engaging with our prospects and our clients, who are cross selling referrals, basically. We do a very good job of keeping track of all of that, and make sure to pat people on the back when they do a standout job. Jean Caragher: Tell me your best piece of advice for your fellow accounting marketers. Lexi McWiggins: It comes back to what we talked about earlier, to keep learning these skills. Competition is stiff out there and not just for marketing jobs, but in accounting. In order to set ourselves and our firms apart we need to keep learning. There is no excuse. The market is changing so much every day. Like I said earlier, Monday mornings is my time to learn, whether it’s learning about data analytics, or design, you can always differentiate yourself in some way. Jean Caragher: Absolutely. Then, what would be your best piece of advice for managing partners? Lexi McWiggins: Maybe just listen to the Marketing Department. No, just kidding. We actually are very, very, lucky at P&N. Our CEO is a huge supporter of basically anything and everything we want to do. He knows that if we’re asking for it we’ve done the research and the time, and it’s worthwhile, so we’re lucky. Following up is something that they all could do better at. We set up the game for them. We put all the pieces into play, but they actually have to close the deals. Just being diligent and determined and not being discouraged when a sale doesn’t happen soon. I think that is important for managing partners. Like I said earlier, sometimes it takes three years for you to see the results of all of the lunches you took someone out to, but just following up and staying persistent with it is crucial. Jean Caragher: It is a very long sales cycle, so oftentimes they give up too quickly. Lexi McWiggins: Exactly. It takes 15 touches to get someone’s attention, 15 touches. That means that you’re going to lunch 15 times, and you’re probably going to lunch once a month at the most. That’s over a year right there. Especially for our younger leaders, we try to show them that it’s okay to go to lunch and nothing happens the first seven times. Just keep going. Jean Caragher: We’ve been talking today with Lexi McWiggins, the Senior Marketing Coordinator, Event Manager, and Graphic Designer at P&N. I think Lexi has made it clear why she was named the 2014 AAM Rookie of the Year. Lexi, congratulations again. Lexi McWiggins: Thank you so much.